Djerba or Jerba is an island of paradoxes. In itself, it is a fairly large island just off the North African coast which has almost no other islands alongside it. And it is a tourist resort, a big one, with plenty of wide open spaces for effortless living. It is easy to access as there is a narrow causeway linking it to the mainland at El Kantara. Djerba has a long and interesting history. It was a well-known port for the Phoenicians and its soft sandy shores were particularly kind to their fragile wooden boats. At that time, the island was called Meninx and the Phoenicians harvested the prolific beds of murex shellfish and were responsible for building the first causeway. The Romans later rebuilt a more substantial pathway through the sea when they arrived to set up a trading port at Djerba.In the Middle Ages when Europe was divided, Djerba was constantly being invaded and was ruled by many different powers. Roger de Loria of Aragon took control in 1284 and built the Borj El Kebir at Houmt Souk. By 1497 the Sicilians had moved in. Shortly after that, Djerba became the headquarters for the Barbarossa brothers who set about expelling the Spanish from Algiers. Privateers, knights, merchants and other groups have all left their mark on Djerba which is reflected in the diverse trades, weaving, agriculture, sponge fishing, olive oil production and ceramics all flourished here. A portion of the inhabitants on modern-day Djerba are Kharijites, the third group in Islam after the Sunnis and Shi´is. The Kharijites have always been known for their unwillingness to get in touch with other people. However there are still some Christians as well as about 1,000 Jews living here. 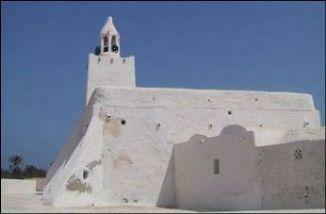 Jerba is appreciated for its definitive architecture, made up of square whitewashed houses. The whole island is like a separate world of its own, so compact that even the laziest travellers can cover most of it. Yet it has enough variety and attractions to satisfy even the most well-travelled globe-trotters who can happily occupy themselves here and have a great time here for at least two weeks. The topography of Jerba is flat and low-lying. The villages are all a few kilometres apart and each has its own individual character, telling its own unique story. Jerba can be laid back, at times surprising and just as charming as enthusiastic Tunisians tell you it is. Life on Jerba is suited to both Tunisians and foreigners (you meet lots of Libyans and Europeans here). Tunisians are keen to throw off their inhibitions when they come here. As so many can stay here without meeting neighbours or relatives, Jerba is the one place in Tunisia where some Tunisian women appear in only the lower halves of their bikinis. On the island of Jerba there are many villages, but almost no towns (click hereto open interactive map). The only real town is the beautiful Houmt Souq, while the second town, Midoun, is less exciting. Many travellers arriving at Jerba pass through the village of Ajim, but far more picturesque is the little-visited Guellala. Many visitors are intrigued by the presence of Jews, whose main synagogue is in Hara Sghira, while the majority live in Hara Kebira. One of the most photographed places in Jerba is the mosque in El May. Unfortunately, many of the people visiting Jerba only stay in the Zone Touristique and never get to see any of the fascinating small places on this unique island. Houmt Souq is the only place on Jerba that can really be called a city, even if there are not many thousands living there. The city, close to the sea, is centred around the beautiful and lively markets. There are two, one vaulted suq which sells everything and another for foodstuffs. The small and colourful suq ends in a couple of squares that are filled with outdoor cafés. They are popular with local Tunisians and consequently have normal prices, and much better quality than places aiming at the tourist trade. It could be said that Houmt Souq has been turned into a tourist trap, but this is only partially true. The style has been here longer than the German tourists, who seem to make up the majority of the foreigners here. It makes a refreshing change for visitors who are unlikely to be hassled by troublesome vendors or hustlers as in some other Tunisian cities. Houmt Souq is quite different from any other Tunisian town south of Sidi Bou Said, which could be considered its lost brother. One of the great things about Houmt Souq are the funduqs that have been hotels for, in some cases, hundreds of years. They are still run in the traditional way and few accommodations have been added, but they are well-priced. For around US$10 each or less per night, you can expect a memorable experience. I stayed in a hotel with vaulted rooms which were shaded by a chalk-white arcade. The doors opened out onto the central courtyard-like atrium which was full of green plants and red flowers with a small pool in the middle. This atrium was a restaurant with traditional music performed live every evening. It is an experience that you will never forget. The upper picture is from this hotel, the Arischa. Houmt Souq has a nice little church lying just between Hotel Arischa and the Mosque of the Turks (picture higher up). Services are still performed here, but the church is now mostly used for non-religious activities among Jerban youth. The other noticeable mosque in Houmt Souq is the Mosque of the Strangers (just above). Down by the sea side, the fort Borju l-Kabir, charges a small admission fee and is well worth the walk down from town centre. 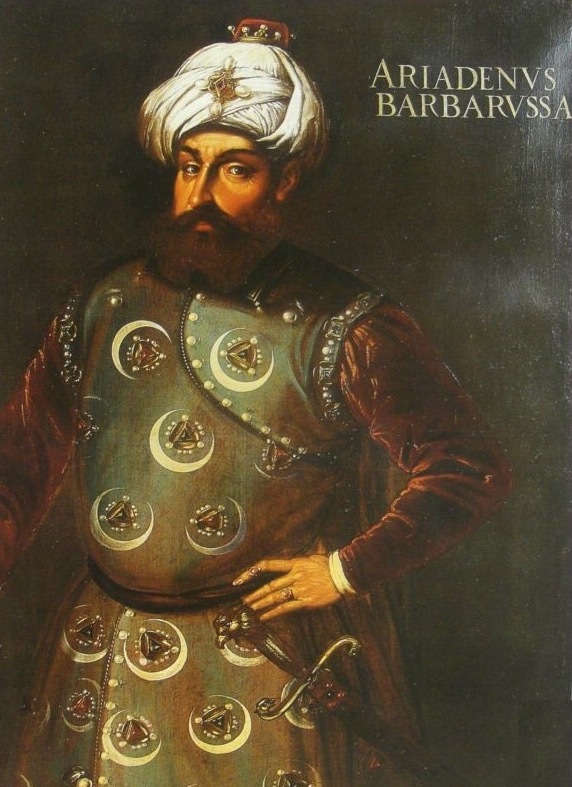 Borj el-Kebir, sometimes called Borj Ghazi Mustapha, has had many rulers over the years. It was a Roman building and was the first recorded stronghold here, but it was the king of Sicily, Roger de Loria, who in 1289 built the very first fortress here. In 1560, the Spanish (who had it transferred from Sicily earlier in history) were driven out by the Ottoman forces. Hundreds, if not thousands, of skulls from the Spanish soldiers were kept on display inside a tower for almost 200 years. Most of the fort was rebuilt by the Ottomans, and hence little now remains of the original building from the time of the Sicilians. You will notice that the majority of the tourists on Jerba are German. 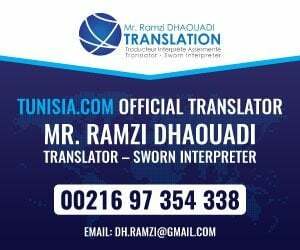 They fill up the touristic zone of Jerba, and the canny small vendors and hustlers down here address you first in German, before they try their halting French. Listen out for the standard opening sentences: “Wie geht’s?”, “Eine Frage bitte”. 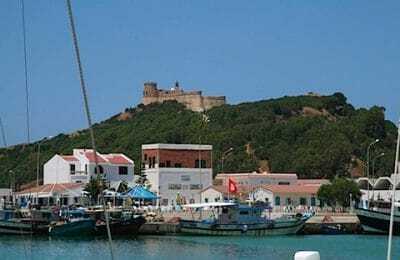 Unfortunately the touristic zone which has such potential to be the base and starting point for some lazy and pleasurable explorations of the island, seems to have turned into a tourist ghetto. Every hotel comes with at least one restaurant, bar and discotheque, as well as ‘animators’, people that have actually gone to school for a couple of years to learn how to amuse charter tourists. Fake Tunisian folklore, jokes and aerobics on the beach seem to have been dominating their curriculum and the true culture of Jerba is lost. 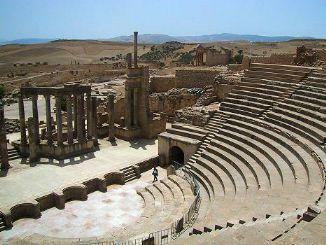 In a place as historic as Jerba this loss of Tunisian culture is sad. Great things are so close, so easy to get to, and people are very friendly. So, even if the beaches are great and you have a good time, these mindless types of holidays on Jerba are really a waste and you could be anywhere in the world. The little community of Hara Kbira is not really remarkable. It has a main street with some grocery stores and a café or two. However, just out of the town centre to the east, past the school and a mosque in typical Jerban style, the main centre of the Jerban Jews can be found – the Ghriba synagogue. This synagogue serves as the focal point of Jews in the whole of North Africa. This is the place where a stone is said to have fallen from heaven and where miracles were performed when the sanctuary was originally built. While this has been a holy place for 1400 years, the present buildings are not more than 75 years old. Most of the construction is a hostel for pilgrims, but it rarely fills up very much anymore. The synagogue can be entered by non-Jews, as long as they leave a small gift (money), and the men must wear kippahs. The interior is only slightly more interesting than the modest exterior, a little bit too gaudy and glaring for most people’s taste. It is said that the inner sanctuary contains one of the oldest Torahs that is still preserved.The relationship between the 100 Jews and the Muslim majority seems to be relaxed, but the Jews of Jerba are considered very conservative, and have suffered from anti-Jewish acts many times. Last time was in 1985 when three worshippers were gunned down inside the synagogue. There are as many as 11 synagogues here, and close to 1,000 Jews make up a substantial part of the population. As this is a place where people work, there are little to see of normal tourist attractions, but while walking around the place, you can look out for the signs in blue colour that have been painted on doorways to guard the families against the evil eye. These signs vary, but may be in the form of fish, hands, or candelabras. Do not let the main street packed with souvenir stalls, mislead you. Most of the time while you are in remote Guellala, there are no other tourists around. Apart from the timid Kharijis who live in this part of Jerba, people down here are very friendly. (The Kharijis are the third and smallest group in Islam. The Kharijis of Jerba still speak their own language and participate little in the local society)The main attraction in the main street is the only souvenir stall that comes without strong colours, the underground one, just where the street bends. This is the only one left in Guellala that shows how ceramics were made before in this town, and the only one selling authentic stuff without the totally inaccurate paintings.Life here is much more simple and civilized and there is less need for heavy haggling on the prices. The people running the shop will in a friendly manner show you the different parts of the workshop, and if you leave without buying anything, they just say good bye with the same friendliness, before lying down again on the bench next to the tiny door leading up into the kitchy main street.If you give yourself time to pause for a moment you will soon have the local specialty demonstrated – the magic camels. These are actually mugs with a spout as a camel’s head, and then a hole in the bottom and the top. You pour water into one hole, turn the camel over, and the water doesn’t leak out. Magic! Walking down to the beach mosque, the road leads past residential quarters and people will stare and smile, or call out friendly greetings while you walk past. The mosque is set in a beautiful location, right next to the sea. This is most unusual as mosques almost always represent the centre of a village or a town. This one, 500 years old, has nothing but palm trees and the sea surrounding it. Somewhat disappointing, mainly because of the glaring gas (petrol) station 5 metres away, the Turkish mosque is strongly reduced in its appearance and effectiveness. Photographers, who cannot enter if they are not Muslims, find themselves fighting to get a good angle by cutting out the cables stretched over the mosque, the neighbouring houses and the dominating strong red glare of the gas station, in order to make their photos capture the concept of Jerba’s tranquility.The mosque as it stands is small, but simply beautiful. The minaret stretches no more than 5-6 metres high, and everything is whitewashed and the walls are soft, almost as if it was a cream covered cake.El May as a village is quite typical, but it has a feeling of always being in the rush hour, as the main road has many cars passing through. The market of El May is small and charming, and is set in a backstreet, about 200 metres from the mosque of the Turkish Mother. As this mosque, just a few kilometres out of Midoun, is apparently no longer in active use it is fully open for visitors to explore within. There is only one distinct thing that makes this mosque a mosque. Most of the structure is typical of Jerba’s profane architecture, but from one corner a one-of-a-kind minaret points to the sky. Since the minaret is small, and it doesn’t really look like a minaret, someone must have come up with the idea of emphasizing its functionality with a light bulb – an element I have never seen used like this before! This mosque is located half way between Jama’ Fadloud and Jama’ Tajdid, and is typical of most small mosques that you stumble across on Jerba. There is little that is special in it, but it is easy to find and is worth a short stop. This mosque lies right before Midoun and serves a larger congregation than most other small mosques of Jerba. It is a mix of typical Jerban mosque designs and has a standard Tunisian minaret.When I visited I asked about the minaret, but none of the locals could tell me whether it belonged to the original structure or was a newer addition. I’m inclined to believe that it is fairly new compared to the rest of the mosque. Of all the small mosques around Jerba, the one at Tajdid is among the most likely to be features in brochures or on wall posters in the hotels. The main reason is the nice setting – it is out in the fields with many trees around it. Midoun: Underground oil-pressesSomewhat less exotic today, the camel that used to walk around in circles in order to power the olive oil press has retired and a profane machine does the job today. Nevertheless, the underground construction, resembling what is found in the Matmata area, takes care of the humidity that is vital for the production of olive oil during the winter. Today, Midoun has only one underground oil press left, but this is easy to visit in the winter months, from November to January. Real Djerban life is not really evident in Midoun. The town is too close to the Zone Touristique to have preserved the culture of the local society. People here have long since adjusted to the presence of photography and the skimpily dressed foreign tourists. Visitors are mainly appreciated by vendors in fairly ordinary souvenir shops. Some of the old Tunisian life returns on Fridays, which is market day. In Aghir too there is less and less of what used to be. Today all that is visible of this once traditional village is a string of package hotels; no local Tunisian houses, simple cafés or hole-in-the-wall shops. Aghir Beach is the Tunisians’ own beach. People camp here and have good swim in one of the few remaining zones that have not been annexed by a huge hotel complex. The beach is still divided into two zones, but one is public and open for all. This is a cherished place for normal Tunisians and both the sea and the beach are full of people. But never more than a few hundred metres away is the closed private beach of the posh white hotels.And this is where it will all eventually end up, I think. More and more private hotel beaches with all the amenities that the western society demands. If you want to swim in these waters you should be very careful as there are many large jellyfish out here.If you get stung seek out a lifeguard if its really bad if not you can find cream at nearly all pharmacies. You can tell the sting by their long lash like marks they leave which can be really unplesant, you may also find the tentacle still all attached.